05:14 PM - PoppyDear mentioned acpart in post Leo and Crestie art! 09:37 PM - Elizabeth Freer mentioned acpart in post Leopard Gecko Wont Open Eyes. Help! 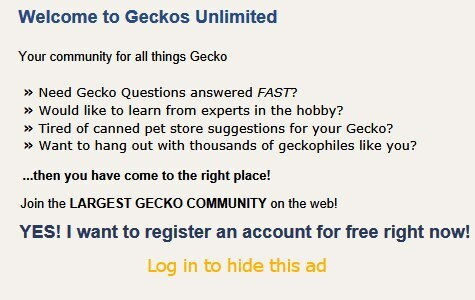 04:35 PM - Electriceclectic mentioned acpart in post Confusion regarding Leopard Gecko heating requirements? 11:41 PM - Geopard Lecko quoted acpart in post Made my own hatchling rack + got some supplies and an incubator! 04:27 AM - Geopard Lecko quoted acpart in post Hello there! 11:58 AM - Geopard Lecko quoted acpart in post Hello there! 08:21 PM - acpart quoted Sg612 in post Questions on keeping and feeding Lygodactylus Williamsi. 10:15 PM - Sg612 quoted acpart in post Questions on keeping and feeding Lygodactylus Williamsi. 10:25 AM - SpottedDragon quoted acpart in post One week to go!